Historic Holiday Destinations in the U.S. Ever want to step back in time and experience a taste of yesteryear and an old fashioned holiday from a bygone era? For those travelers seeking a glimpse into Christmas’ past when the holidays were more about family and cozy fireplace gatherings with a taste of history look no further than these historic holiday destinations. Newport, Rhode Island, Annapolis, Maryland, Charleston South Carolina and Jackson Hole, Wyoming all fit the bill and reveal a genuine taste of Americana. Caroling, tree lightings, boat parades, ice-skating parties, sleigh rides and steaming hot chocolate for all are just a sampling of treats in store at these historic getaways that display a taste of nostalgia when the holidays were a far simpler affair. The Civil War, the Gilded Age, maritime and western history are chapters in the American story and all of these distinctive destinations offer a taste of history combined with the joy of the holiday season. Images of the glorious Gilded Age and the Great Gatsby era come to life at this lovely seaport town that overlooks the Narragansett Bay and the Atlantic Ocean. Once the home to the America’s cup sailing regatta, today this enchanting village is renowned for its string of handsomely restored mansions along Bellevue Avenue that once belonged to the Vanderbilt’s, and heiress Doris Duke among others. The names of Jack and Jackie Kennedy (they were married in Newport), author Thornton Wilder and actress Grace Kelly can also be added to Newport’s illustrious list. During the holidays all of the mansions are bedecked in holiday splendor with the Breakers, the Elms and Marble House filled with a profusion of poinsettias, evergreens and wreaths. Special programs such as “Holiday Evenings at the Breakers” including a dinner dance complete with elegant table settings, refreshments and guests dressed to the nines add to the festive activities. 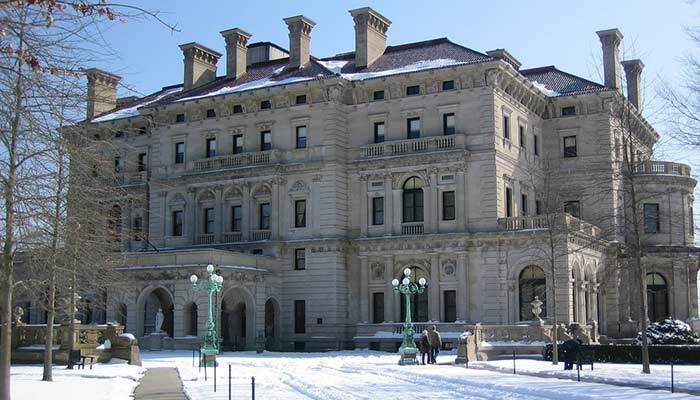 The Breakers, the grandest of the Newport mansions, was built in 1895 as a summer cottage for shipping magnate Cornelius Vanderbilt. Marble House, another former Vanderbilt estate, displays a towering Christmas tree at its entranceway. 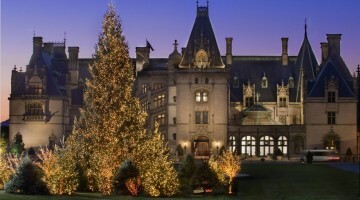 Rosecliff, another one of the Preservation Society of Newport’s mansions, is also adorned for the holidays and presents “The Nutcracker” on select evenings. The Breakers, the Elms and Marble House will be decorated for the holidays from Saturday, November 22 through Christmas Eve with the last tour on December 24th at 3 p.m. Shopping at the mansion stores is another treat on a visit, unique crystal and china gifts as well as books and various items most associated with the mansions and their history is found on the premises. Newport is abundant with choice accommodations but a couple of standouts include the Hotel Viking and the Inn at Castle Hill. The Hotel Viking, a member of the Historic Hotels of America, opened its doors in 1926, and remains one of Newport’s most preferred addresses. Extensive renovations and remodeling throughout its history has ensured that this Newport treasure maintains the standards it was originally designed for. Managed by the Noble House Group, it is a perennial favorite for frequent guests to Newport. Its location in the historic district coupled with its storied history maintains its stature as one of the best places to stay in Newport. 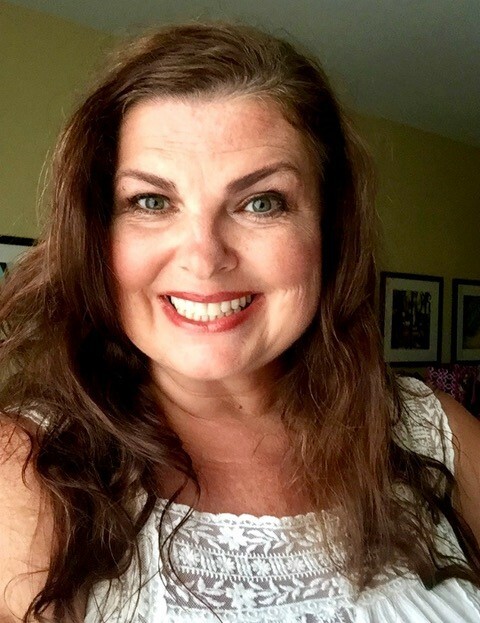 Its roster of guests reads like a Who’s Who directory with past guests including musician and songwriter Bob Dylan to Jack Bouvier, Jackie Kennedy’s father who stayed at the Viking while in town for his daughter’s wedding. The Inn at Castle Hill is also steeped in history and legends. Dating back to 1874, the inn was originally the home of Harvard University professor Alexander Agassiz. Surrounded by trees with an oceanfront setting has made the inn a favorite for a long list of luminaries including author Thornton Wilder who frequently stayed at the oceanfront property and actress Grace Kelly. Kelly when filming “High Society” with Bing Crosby and Frank Sinatra found solace at the inn after a hard day of filming and often retreated here for rest and relaxation. In fact she spent so much time on the beach that it is named after her. During the holidays everything from gingerbread houses and a towering Christmas tree and an elaborate Christmas feast are its highlights during the holidays. Another beautiful maritime destination with as much charm and history as Newport is Annapolis. Imagine a wave of bright and billowing sails gliding across the Chesapeake Bay in the summertime and you have one stunning snapshot of Maryland’s rich seaport heritage. Home to the U.S. Naval Academy, Maryland’s capital city puts on its holiday show with the Eastport Yacht Club’s Lights Parade that has become a favorite annual holiday tradition when a flotilla of boats in all shapes and sizes and adorned with brilliant holiday lights skim along the Severn River in front of the U.S. Naval Academy and City Dock. Another annual holiday event if you can get tickets is the Naval Academy Glee Club’s presentation of “The Messiah” in early December. Performed in the Main Chapel at the Academy, it is an emotional spellbinder as the midshipmen attired in their dress blues fill the magnificent chapel and begin the musical program. This is an event you will not soon forget. While in the area nearby Preble Hall is where you will find the Naval Academy History Museum where vintage ship models, uniforms, photographs of famous graduates and chapters in American Naval history can be observed as well as a unique gift shop for finding an array of nautical gifts and naval inspired gifts. Lights on the Bay is another popular holiday event where from mid-November through New Year’s Day one can drive through Sandy Point State Park and see more than 60 animated holiday displays including Santa and his sleigh, Rudolph the Red Nosed Reindeer and brightly colored holiday displays. Candle strolls on certain evenings on the City Dock and concerts at the Maryland State House round out a sampling of holiday offerings in Annapolis. Annapolis abounds with historic lodging choices with the Historic Inns of Annapolis just steps away from the State Capitol an exceptional choice for history buffs. Long the favorite for visiting yachtsmen, stage legislators and Naval Academy grads, three buildings, the Governor Calvert, Maryland Inn and Robert Johnson House, make up the engaging complex of rooms and suites. Composed of three buildings, all featuring 18th-century architecture, the Maryland Inn was originally built as a residence in 1765 and has undergone a series of transformations throughout its history without losing its historic integrity. Two of its inns face the Maryland State House, where the Treaty of Paris was signed in 1784. The inn’s oldest section is the Governor Calvert house that was constructed in 1727. The Treaty of Paris Restaurant also dates back to the 18th-century and with its exposed brick walls and cozy fireplace setting makes it a local favorite. Expect to enjoy those renowned Chesapeake Maryland blue crabs at this delightful dining spot for lunch and dinner. Few places in the American South conjure up as much history and beauty as Charleston. Cobblestoned streets, piazza porches with caressing breezes off the Ashley River, Rainbow Row and carriage rides along the Battery are just a few images of this truly original destination. Ravaged and almost completely decimated during the Civil War when the motto following the conflict was “Too poor to paint, to proud to whitewash,”Charlestonians zealously embraced the rebuilding of their city where today its historic district is our nation’s best preserved and a showcase for antebellum, Victorian and Federal style buildings. Charleston is most famous for its Charleston Strolls through the historic district. During the holidays sign up for these excellent outings where knowledgeable guides will tell enthralling stories of Charleston from 1670 to the present. 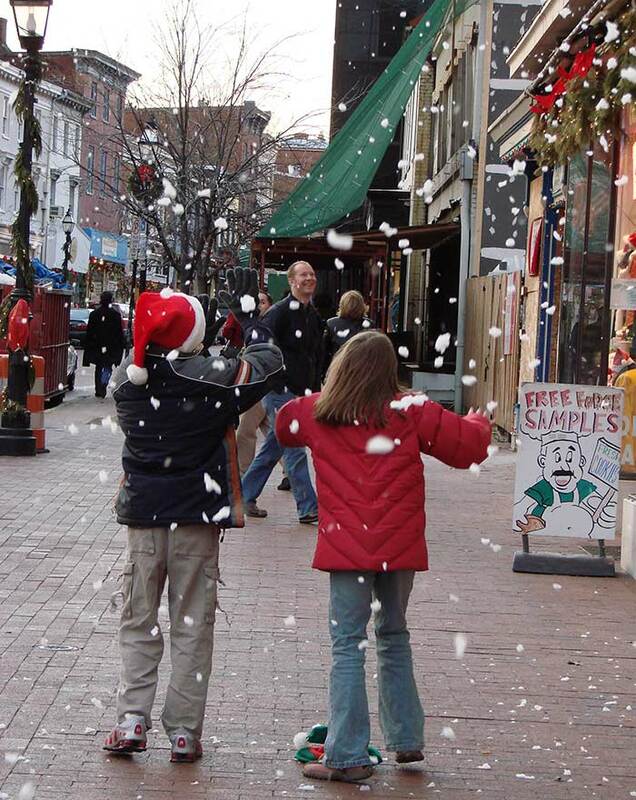 Walking along you will see decorated doorways and vintage holiday decorations as you navigate this tour. 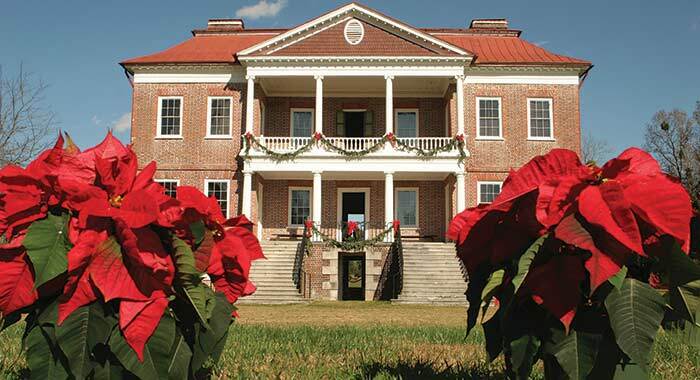 A visit to Drayton Hall, Boone Plantation and Middleton Place, all plantations along the River Road, recall Christmas in Charleston during the 1860’s. A Victorian holiday experience can be enjoyed at the Edmonston-Alston House, a member of the Historic Charleston Foundation, which retells the story of Charleston on the eve of the Civil War with the Grand Illuminations at Middleton Place complete with warm fires and dramatic presentations accentuating a lavish Christmas buffet supper. For shopping enthusiasts be sure and stop in at the Historic Charleston Foundation shops in the Market area and the historic district. All of the proceeds from the shops go back into the foundation to preserve the homes in its collection. China, crystal, tree ornaments, antique reproductions and a wealth of books about Charleston are found at this outstanding shopping emporium. Historic inns from large and opulent to small and intimate are found in Charleston’s historic district. The John Rutledge Inn is one of the most historic. Italian marble fireplaces, 12-foot high ceilings and canopy beds are found in all of its King Rooms and accent its enduring appeal with the Progressive Christmas Dinner Package offered from November 28-December 23rd. This holiday event begins at its sister property the Kings Courtyard before a carriage ride escorts you to the Circa 1886 Restaurant for a three-course dinner. This package includes accommodations for two at the John Rutledge House Inn, a rickshaw ride to the Kings Courtyard, two seats at the Progressive dinner and a Southern Living Cookbook. The John Rutledge Inn, named after John Rutledge, a signer of the U.S. Constitution, was built in 1763 and offers elegant accommodations in the heart Charleston’s historic district. Afternoon tea is also included in the AAA Four-Diamond property. The Wentworth Mansion, a 21-room Five-Diamond property, is one of the city’s finest and most elegant choices with the East Wing Rooms displaying an original gas fireplace and exquisite antiques. The Mansion Suites are the most opulent displaying Italian crystal chandeliers in some rooms, gas fireplaces and sun rooms in select rooms. Staying here will resemble staying in a very fine Charleston family residence where amenities include a full homemade breakfast in its restaurant Circa 1886, afternoon tea, evening port and sherry and chocolates on your pillow at night. A luxury spa is also found on the site. When it comes to an authentic western-themed holiday, Jackson Hole has no peer. Its sublime setting of the Grand Teton and Yellowstone National Parks make this one stunning destination on a holiday outing. Discovered by mountain men Davey Jackson, its namesake, and John Colter, the setting alone is worth the trip where miles upon miles on an unspoiled wilderness have made this Wyoming’s most breathtaking destination. 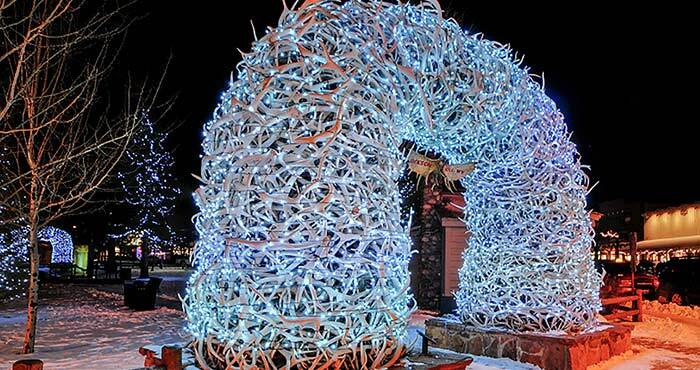 Twinkling lights adorning Antler Square heralds in the holidays. A visit from Santa complete with holiday music, Christmas carols and hot chocolate for all make this annual event in December a favorite western getaway not only for skiers who converge on the mountain from around the glove during the winter season for also for travelers desiring to feel like the Old West is alive and well. Jackson Hole has maintained its western identity where elevated boardwalks, stagecoach rides around Antler Square and an impressive collection of art galleries and western shops define its identity. During the holidays some great choices include Iditarod sleigh rides through snow-covered trails, ice skating at one of its five skating rinks and skiing atop Snow King Mountain are additional excursions one can enjoy while in Jackson. Don’t miss seeing the largest herd of elk at the National Elk Refuge just outside of town where sleigh rides are offered from mid-December through mid-April. Another recommended stop should also include the National Museum of Western Art that overlooks the elk refuge and exhibits some of the West’s most renowned painters and sculptors from Carl Rungius to Robert Bateman and Frederic Remington. Towering bronze sculptures of wildlife surround the property. Plan on spending a day at this remarkable art museum where a gift shop and café are found on the premises. Some other choice shopping spots are found in town. Everything from art galleries to shops displaying all things western can be found in Jackson near Antler Square. For nature enthusiasts and photographers the Wild by Nature Gallery with photography of Henry Holdsworth is a must. Holdsworth, a resident of Jackson, has spent years going out into Jackson’s environs capturing images of its wildlife including; coyote, bear, fox and bison. The Wort Hotel is Jackson’s most historic hotel and one of the areas’ most important architectural landmarks. The hotel, opened in 1941, recaptures visions of the Old West where its 59 rooms display western art and design. During the holidays the hotel puts on its annual event, “Twelve Days of Christmas” where beginning in early December an event is held almost daily celebrating the holidays. Brilliant red poinsettias frame the grand staircase along with a Christmas tree in the lobby adding to the festive environment. Everyone from cowboys to movie stars has stayed at the Wort with its Silver Dollar Bar a popular gathering spot in the evenings for locals and visitors alike. Some treats in store during its “Twelve Days of Christmas” include a children’s art show, gingerbread house making courses with the hotel’s chefs, Old Time Christmas stories where music and stories along with refreshments are offered to the Christmas Day Buffet feast, the best in the valley where turkey with all the trimmings makes this Jackson’s most popular place to have that Christmas dinner. Be sure and book early for this popular event. So whether you opt for Newport in all its Gilded Age glory, Annapolis with its rich naval heritage, Charleston with pages from its Civil War past or Jackson Hole with its tales of the Old West – your holidays are sure to be an exceptional and memorable time traveling experience.